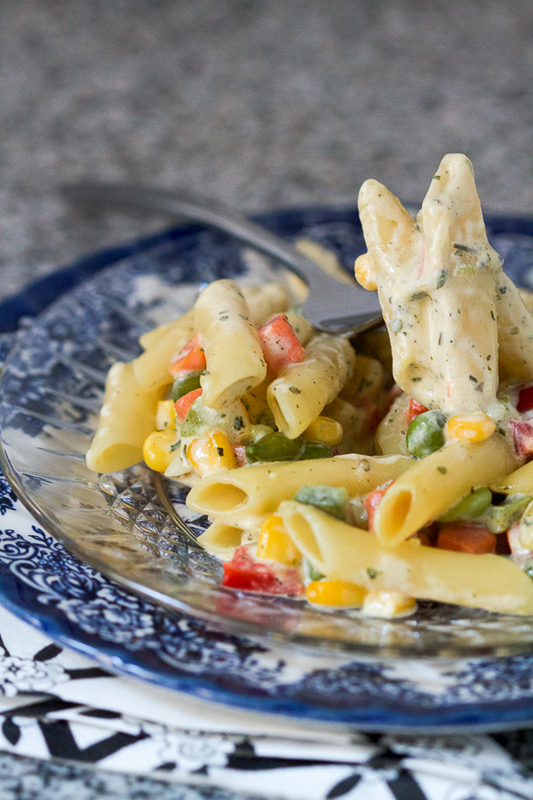 Pasta with veggies in white sauce is lightening fast for those days when you want something quick, something healthy, something comforting. Pasta in white sauce is one of those dishes I designate as fast. This means it’s tasty and it’s quick. Perfect for those situations when I’m in a hurry and don’t have a lot of time to cook. Today, as people don’t have much time to spend in the kitchen, recipes like these are gold. Besides, I’m a big fan of all type of pasta: penne, spaghetti, and all others. 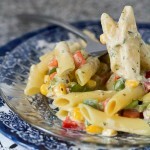 Therefore, when I want something fast, pasta in heavy cream white sauce is a great choice. What I like about meals like these is the simplicity. There is not much effort involved, nor some special technique necessary to acquire, like you have to with more complicated dishes. Pasta allows you to be creative, as it’s generally served along some type of sauce, so you can let your imagination run. You can come up with all kinds of different sauces, and add various ingredients you like to eat, and spice them up differently. For example, I like heavy cream, and use it a lot for different dishes, as it’s ideal as a sauce. And if I’m by myself, and don’t plan to go out that day, I spice it up with a lot of garlic. I am crazy about it. Anyhow, you get the point. Where sauces are concerned, be creative and play. Be free! Also, I’ll add a few tips for a tasty pasta. We’ve gone over these before, but it’s a good refresher. First of all: always cook pasta in a lot of water. Use only large pots that you’ll fill up with lots of water. This will help you avoid stickiness, and will allow pasta to cook evenly. Secondly: Don’t use oil. You don’t need it. Thirdly: Salt the water really well. Fourth and final: After cooking, drain hot water and don’t run cold water over pasta. What I often think about while making pasta is how lucky we are today. My grandmother had to make her own. At that time, pasta was not as available as today, and this was not a very long time ago. She’d make the dough, a little thicker than the one used for pita, and would stretch it out over the entire kitchen table. She then used to paint it with eggs, and leave it out to dry for a while. At this point she used to cut it up into small strips with some type of a knife, I’m not sure what’s even called, but it looked like the one we use for pizza. This allowed her to get thin strips the width of a finger. She’d leave them out to dry for a good time, until they hardened. The egg paint would allow it to became golden as it dried on the table. That’s how it was back then. For cookery one needed time and patience. And today, all you need is a few minutes in a boiling water. 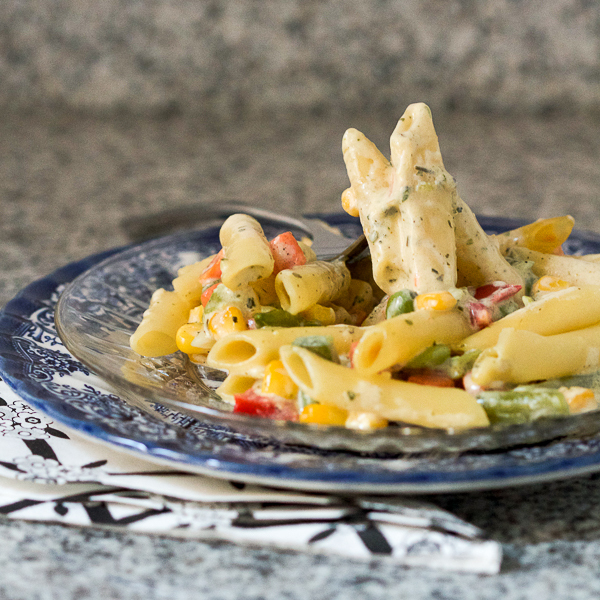 So when you’re out of time and want something quick, make yourself some pasta with veggies in a white sauce. In a deep pan heat butter on medium temperature. Add vegetables and water. Stir and cook 15 to 20 minutes or until vegetables are soft. Add heavy cream, bouillon, mustard, Parmesan and parsley to vegetables stir, then bring to a boil. Let boil for a minute or two. Lower heat and continue cooking an additional 10 minutes. 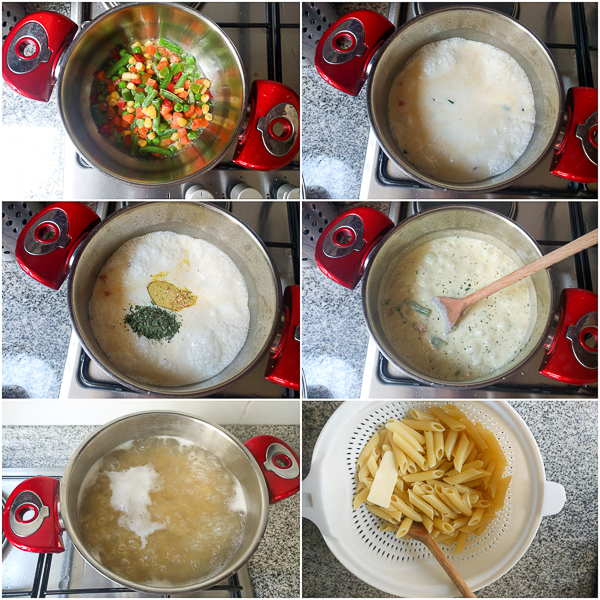 Cook pasta based on box directions. The time may vary depending on whether you’re using fresh or frozen vegetables. This was the saltiest dish I’ve ever made. Not sure what I did wrong . Not sure what happened there. Thanks for letting me know though. Although I haven’t had the same problem I made a note about the seasonings.